When the Calderdale Joint Committee was formed in the early 1970s several vehicles were acquired from nearby NBC companies. These came mainly from the former Hebble concern and Yorkshire Woollen, however also bought were three Marshall bodied Leyland Leopards from Yorkshire Traction. These were bodied by Marshall and were 45 seat examples. One of the trio is seen at the Leeds departure point for the former Hebble service to Burnley. NHE 10F fleet number 360 was originally fleet number 510 in the Yorkshire Traction fleet. 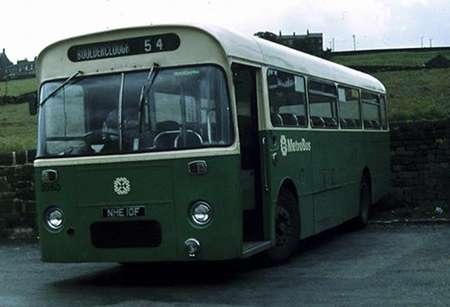 To be clear, the 8 was not an original Hebble service to Burnley, but a new service created following Hebble and Todmorden entering the Halifax fold and the subsequent reorganisation. It followed the original Hebble service from Leeds through Halifax to Hebden Bridge but then took the more remunerative valley route through Todmorden to Burnley. This is however where the original Hebble service to Burnley would have started. The following comment has been re posted because I originally only posted part of Johns comment of which I do apologise, I work better when it is busy. Ah yes, this takes me back. I remember back in my early days with Halifax Corporation my own duty being cancelled one evening in order that my conductor and I could be used elsewhere. He was given a duty with another driver whose conductor had gone home sick, and I was asked to work two trips on the 8 Leeds route. The inspector had not taken into account that this was an OMO route and I was strictly a crew driver. I told him I did not know the route anyway, but he still tried to persuade me to no avail, then very grudgingly had to cancel the first trip and, but then later triumphantly announced that he’d managed to grab a conductor who should have been finishing a middle turn, to do the last trip for overtime. He would show me the way – problem solved. Hmmm. I walked up to the Bus Station to find one of these ex-YTC Leopards on the stand. At the last minute the conductor arrived. I’d never seen him before. "Hi mate !" he said, "I hope you know where you’re going ‘cos I haven’t a clue". "You’re joking," I replied, "You’re supposed to be showing me". "But I only just came out of the conducting school yesterday – this is my first day on the road" he said. Fantastic ! The grumpy bus station inspector – Ronnie Weston – just shrugged disinterestedly and told us "Too late now lad, you’ll just have to manage". So off we went, embarrassingly having to ask directions from passengers (of which there were very few), and somehow we reached King Street terminus in Leeds, where this photo was taken. On the way back, circumnavigating the Armley Giratory, a chap said "…take your next turn off" – so I did literally, and found myself in the cul-de-sac of what I think was the small car park of the Gas Board Training School ! Red faces all round and after a lot of shunting and heaving I managed to extricate our Leopard and got back onto the proper route. I only just managed at the last minute to avoid missing the slip road off Stanningley Road up to Bramley Town End – which would have led us onto the Stanningley By-Pass and missed out about two miles of the route (and probably left several passengers well out of their way), then I managed to find my way back without further incident. You never forget days like that. These three buses were quite reasonable to drive once you’d managed to install yourself into the cab seat, and provided you were not a large person or had long legs. The pneumocyclic gearchange pedestal was of the original larger type (like our Worldmasters and PD3A’s – they changed to a miniature version from the PSU4B onwards) and it was very awkwardly positioned close to the left and slightly forward of the driving seat, making access to it only easy for a contortionist. The steering wheel was set very low, so unless you wound the seat almost to the floor and adopted a seriously deformed and painfully uncomfortable posture, your knees were jammed under the wheel, which rubbed against your legs as you turned it. Compared with our ‘own’ single deckers – including the DP’s with similar BET-style screens – the windscreens on these seemed to be twice the distance in front, which was quite off-putting, particularly to me as a relatively inexperienced driver. This particular bus – 360 – was in PTE days written off in a serious collision, and for many years after a photograph of it in wrecked state was pinned to the wall of the Skircoat Foremens’ office. They had quite a gallery of such things – always having a very low opinion of us drivers and wishing to make some sort of point. So it was quite a surprise when on holiday in Malta in the 1990’s to meet up with it again there, rebuilt and beautifully turned out. I think I have a photo of it so will have to delve through my disorganised old holiday photos and see if I can post a copy. Its even more complicated than David suggests! The Calderdale 8, as described by David, was a limited-stop service that only ran for a couple of years. From what I can work out – as a welcome relief to pre-Hilary Term (last-minute!) lesson-planning – after Halifax JOC absorbed various Hebble routes in 2/71 the hourly through service between Burnley-Blackshaw Head-Halifax-Leeds was divided at Halifax, with Halifax-Leeds becoming 8 (Burnley-Blackshaw Head-Halifax being much reduced between Burnley-Blackshaw Head, with the Blackshaw Head-Halifax section incorporated into an extended Heptonstall-Halifax ex Halifax JOC service), whilst the hourly through Rochdale-Halifax-Leeds services continued as 27/28. Then, after the Halifax-Todmorden JOC merger in 9/71, the 8 was extended again through to Burnley (via Todmorden, rather than Blackshaw Head [as per Hebble 15]) on a limited-stop (fare-stage only) basis between Todmorden and the Halifax/Queensbury & Shelf UDC boundary at Northowram – I think the 27/28 also operated limited stop over the common short distance between Halifax town centre and the borough boundary at Northowram. On 2/4/73 the limited stop facilities were withdrawn in the evenings. And then on 1/10/73 the Burnley-Todmorden-Halifax-Leeds 8 was withdrawn between Burnley-Halifax when the "stopper" Portsmouth-Todmorden-Halifax 92 was extended back to Burnley. The building behind 360 was re-developed in the last decade, but the Bank-of-England money store to the left of that building still stands (although though no longer a money store), and you won’t see that "no-entry" sign there now as the traffic flow along St Paul’s St has now been reversed. 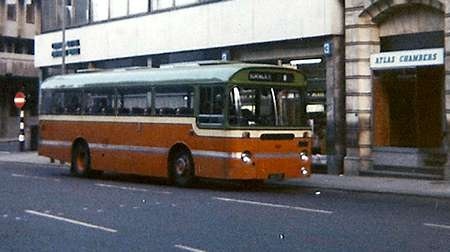 This photograph has got me thinking: in LCT days YWD/ Ledgard/Hebble services from the west/south were kept on the fringes of the city centre at terminal points such as this, then under WYPTE were extended through the congested shopping centre into the Central Bus Station – such that it now takes ages for buses to crawl that last mile-or-so to/from the terminus . . . wouldn’t it make more sense to remove bus termini to their original termini, and "allow" passengers to walk that bit further into town (who actually transfers from one bus to another at a bus station?) reducing congestion and pollution. Reading your comments, John, I experienced a sense of déjà vu. After 4½ years in a London Transport office, I turned up (from the deep south – i.e Croydon, well south of the Watford watershed) for my first day of work in the Traffic Office of HPTD on a Monday in December 1964. On the Friday of that first week, still bemused by my surroundings, a multi bank Ultimate machine was thrust into my hands with the remark, "There lad, we need a conductor for the 3.30 Brighouse. Fred Bull is your driver." With extreme trepidation, not knowing either the geography or the lingo, I endeavoured to meet the occasion. The first bit – over the top via Southowram to Brighouse in a Leopard – was not too bad. Fred was the Conductor School Instructor, so he helped me along, but worse was to come. After the Brighouse runs we went back to the depot and collected one of the old 1947 all Leyland PD2/1s and set off from the town centre for Greetland and Norland, and, for all I can recall, the Moon. It was now the peak period, Fred was now isolated from me in his cab, the bus was full, the windows were steamed up, it was dark outside, and I hadn’t a clue where I was en route. To add to the fun, I had to decipher the required destinations of the passengers which were given in broad Yorkshire accents, and I then found that the places asked for went under totally different names in the printed faretable. Heaven alone knows what I charged them all. We made several trips out again, and the local populace must have thought that the Halifax Passenger Transport Department had been reduced to employing idiots, such was my low level of expertise in the role of conductor. Thankfully, at the end of it all, good old Fred helped his shell shocked ‘mate’ to complete his waybill and cash in. I was a reasonably normal looking 23 year old at the start of that nightmare. At the end I looked like Methuselah (some would say that I still do – I blame HPTD). John mentions the large area of unused space between the steering wheel and the windscreen This was not confined to YTC vehicles. I had a ride on a Devon General AEC Reliance of similar vintage at a Chatsworth rally some years ago and this too had acres of space between driver and window although in this case the bodywork was by Willowbrook rather than Marshall. I think the gap between the steering wheel and windscreens of BET bodies in this era was to do with their interest in the Clayton UHV heating/ventilation system which drew in air from a grille below the windscreen and then through a glass fibre duct to the engine radiator. There was a flap in the duct, cable operated from the cab which diverted the cool ambient temperature air into the saloon during the warm months. The system was logical but hopelessly unreliable. Most BET subsidiaries would have this kit fitted around this time. The 1965 PMT Reliance 590 DPs certainly were so equipped and my recollection of the ex Yorkshire Traction trio at Halifax was that they were as well. I seem to remember heating problems with them in winter……..not that that was difficult, it applied to most designs within the fleet! The noisy old underseat heater units were amongst the best apart from clogging with dust and rubbish. If it was a Reliance 470 then you might get warmth for a couple of days after repair before the head gaskets blew again! Love your ‘thrown to the wolves’ story, Roger. Nothing to do with buses, but I once worked as a semi-manager in a punched-card unit. Despite never training on the machines, I was competent in the job. A job as trainer came up, the woman who accepted it turned it down at the last minute and I was asked and accepted on the Thursday. However, I asked that the course for the following Monday be postponed for a week to enable to me familiarise myself with the course material and learn the working of that machine. On the Monday, having just started to look at the course material, there was a knock at the door and a face said, “We’ve just arrived for the course!” In the end, I sent them for a long teabreak, ‘genned’ up enough to cover until lunchtime, at lunch, did enough for teabreak and later sent them home early! Then, each night, I did enough to cover the nest day. Somehow I got through the week and got one of my ex-staff to train me on Saturday on the machine for the following week. I survived somehow, but a couple of years later, I was talking to one of my first protégés and mentioned they were my first course and had they realised? I was given 7/10, the first time, perhaps, that the pupils had marked the tutor! As she said, they survived! The dark oblong under the windscreen is presumably the intake for the apparatus mentioned by Ian. I vividly recall Ribble Leopards had the same arrangement. Interesting to hear that 360 gave further service in Malta. I recall riding on it on visits in 2004 and 2009. By the latter year, former 360 had lost its Leyland 0.600 engine for a Cummins C unit, very much transforming its personality and performance. The Maltese bus operators in their final independent days had turned to the Cummins C engine big-time – surviving AEC Reliances and Swifts had received similar engine transplants, and some Fords were also advertising their Cummins power. I well remember the Conductor School Instructor, Fred Bull. He was quite a droll character, and used to call in on the Traffic Office from time to time. After three days in his school, new recruits were sent out to accompany an experienced conductor for just a couple of hours or so on the Thursday during the morning off-peak, in order to observe how the job worked. They then returned to him for the rest of the day after which they worked full duties under the supervision of another trusty conductor until the Wednesday of the second week, after which they were let loose on their own. It sometimes fell on me as a Traffic Clerk to find appropriate duties with ‘suitable’ conductors for these lads (and occasionally lasses), and I had to have these ready and clearly written down for Fred Bull when he graced us with his presence and dry wit. He retired in 1973, and was replaced by driver Roy Greenwood, who in turn retired and was replaced by conductor Les Sykes. After the last conductor was set on about 1984/85, Les had little to do, and mostly just took care of uniform issue until retiring at deregulation time. I in the meantime had long since thrown in the Traffic Clerk towel, due to intolerable harassment influenced by a certain Traffic Superintendent, and having already obtained my PSV whilst working in the office, gone full time driving. From deregulation on, all new staff were set on as OPO drivers, and what had been the ‘conductor’ aspect of training had to be incorporated into the driver training – once they had passed their test. Whereas newly passed out drivers had previously little need to do much route learning, as they had already learnt them all well whilst conducting, this also had to be incorporated into their training at the same time and the whole lot became the responsibility of the Driving Instructors. It was at this point that the existing instructors – by then senior men Ernest Mitchell and Gerry Yardley – decided that things ahead were looking a bit too hectic and complicated for them, and opted for early retirement before D-Day. It was at this point that I made the rather impulsive decision to apply for the job, which I got, and was kept very busy at it (and much more besides) for the next 18 years. Sadly once more, irreconcilable differences with another colleague forced me to finally realise enough had been enough, and it was back to driving again. Now I am a semi-retired part-time driver working just three days a week. It’s been a long time ! Why is it that "Line Managers" – be they Headmasters, Traffic Superintendents (or whatever their appointed role) need to make life difficult for colleagues rather than help them – especially those who have had the other role "on their way up"? Ian’s comments about the Clayton automatic heating and ventilating system fitted by the BET group in the mid sixties brings back many unpleasant memories of Southdown’s batch of Weymann bodied Leopards 140-159 so fitted, these buses had a total lack of opening windows but had two roof vents which were permanently fixed slightly open but worst of all they did not have any type of fan assistance in the demister system relying solely on the movement of the vehicle for any effect not very reliable on stage carriage or in traffic. As you can imagine this meant that in warm weather driver and passengers were very prone to sweating and in winter they were freezing cold with the added bonus that the driver could not see where he was going as his windscreen was constantly misting up and the interior of the saloon was also likely to be damp, the system never worked satisfactorily as the control cables seized and the sensors that controlled the pneumatic valves didn’t operate properly. I don’t however recall there being a excess of space behind the windscreen, Southdown did later fit just one sliding window each side and much later fitted a heated windscreen, perversely only on the nearside, 144 of the batch was re-bodied by Marshall after an accident. The company also had a batch of Plaxton bodied Leopards 1191-1224 fitted with this system to which all the above criticisms apply with the added discomfort of having vinyl covered seats. Unfortunately David, the attitude of the Traffic Superintendent towards me at the time was entirely a personal and totally inappropriate one. Unbeknown to me, when Geoffrey Hilditch offered me the Traffic Clerk post this character – who lived not far from me – thoroughly disliked my father’s family apparently owing to issues with my Grandfather (whom I never knew, having died long before I was born) going right back before the war. It must have seemed to him to be his one golden opportunity to wreak some kind of final futile revenge on the family by making life so intolerable for me that I would surely leave. Nowadays harassment in the workplace is a serious issue (though it still goes on), but then nobody took it seriously – particularly as the man was well regarded both by my office colleagues and the trade union – and since the matter was making me ill, I could see no other way at the time but to give in, and he got his way. On another website recently, a former long serving employee of Bradford City Transport recalled how working for BCT was like ‘being part of one big family’, implying that it had been on the whole quite an agreeable experience. But there are families, and there are families. There are ‘normal’ families who despite life’s occasional differences and troubles mostly get on well and care for one another. Then there are those broken and dysfunctional families who are always at each others’ throats, feuding, bearing grudges and carrying on vendettas against one another. I found Halifax Corporation and its successors fell more into the latter category ! There were of course also hundreds of great people employed along the way too, but it only takes a few malevolent ones in the more influential positions of authority to perpetuate a permanently unhappy environment, and as a result create an un-cooperative, deeply cynical and resentful workforce. It’s utterly counter-productive, but they never seem to learn that this is not the way to get the best out of people and for their organisations to succeed and be the best. John, your recollections of HPTD gel with mine in several aspects. In 1964, having upped sticks and journeyed some 200 miles north for the Traffic Clerk job in Halifax, I found my reception from the people there there to be decidedly strange, varying from the very welcoming to the markedly hostile. Amongst some of the latter, which included the Deputy Traffic Superintendent (the Traffic Superintendent always kept me at arm’s length, having as little to do with me as possible) I was referred to as the "cockney", which, while not bothering me, illustrated a degree of isolationism and ignorance that manifested itself in many other ways. Being born in Selsdon, Croydon, in 1941, the only way I could have heard the sound of Bow Bells would have been by telephone, and those peals would then have indicated a German invasion. The system within the Traffic Office was for us all to move round the various jobs – duty cover, schedules, bus list, accidents/private hire et al – every couple of months or so. Unfortunately, in 1965, I suffered a broken leg and had some time on sick leave. On my return, I found that all the others in the office had decided to pick the jobs they liked best and keep them. I was left with the unpopular, mundane task of processing accident reports and quoting for private hires from a fixed price sheet. To further sour the pill, this job was carried out at a desk within the office of the DTS. This was not the sort of thing I had been led by GGH to believe would constitute my career in the municipal bus industry. I stuck it for the best part of a year, and it was only the evening and Saturday overtime driving work with decent people from the road staff that kept me there that long. Differences with the DTS finally came to a head, and I quit towards the end of 1966. It was the best thing I did. Had I stayed I would have simply rotted away in mediocre drudgery. As it was, after 18 months with Aldershot and District as a driver to shake off the memories of Halifax, I went back into the administrative side of the bus industry, ultimately as a Traffic Manager until the gibbet of privatisation cut it short. After a period running my own retail business for several years, I, like you, finished off in the bus industry as a driver, this time in Peterborough and Huntingdonshire. I wasn’t sorry to retire from it – the bus industry was a mere shadow of its former self by then. I haven’t driven a bus since. If the link doesn’t work (I know Flickr can be sensitive in this respect), then do a search for "TUO74J" in photos from Martyn Hearson (Renown). Basically, the chassis were designed for 30′ long buses, but most were being built to 10m length by then, partly to provide a wider entrance. How nice to see Ernest Mitchell mentioned here, I remember Ernest as one of the original drivers when one man operation was introduced on the Siddal route around 1958 when we used to travel to school in Halifax, he was a regular on this route and Norton Tower for many years . When I got married he drove past St Marks church in 1968 and despite around 25 people onboard stopped and called out "there’s no going back now". He was one of the most cheerful blokes you could meet, and over the years I lost contact with him, so you can imagine how surprised I was when I had to help a lady to her flat after a fall to see a picture of Ernest on the sideboard, yes she was Ernest’s wife, and so lots of reminiscing was done. She is still alive and well and had a number of photos taken of his "bus" days throughout his long career. People said that the one maners wouldn’t last (1958), they got that one wrong??? I have attached a photo taken of this bus on 19th June 1980 very close to final withdrawal by West Yorkshire PTE. It is at the reversing point at the small hamlet of Boulderclough high above the Calder Valley. It has a noticeably different frontal appearance from the earlier picture. This was a result of repairs following serious damage when it slid into a lamp standard in heavy snow causing a heavy impact to the centre front. Memory says that we obtained a new front dome from Willowbrook of a different profile from the Marshall original. Also I believe we removed the Clayton UHV heating system (the intake ducting behind the front panel would have been seriously damaged in the collision) hence the different lower level air intake grille.